Did Nacho Beristain’s opinion cost Juan Manuel Marquez? By John J. Raspanti, Doghouse Boxing: As the debate rages on regarding who won the third fight between Manny Pacquiao and Juan Manuel Marquez, the question I want answered is what was Nacho Beristain thinking? Why would the Yoda of trainers tell his fighter, who was on the verge of a colossal achievement, he was winning after eight rounds? Beristain had complained openly about the scoring in the first two fights. So here we go again. Beristain feels that his fighter is winning. Had he forgotten about his complaints from the first two fights? How could he be so sure the Las Vegas judges would agree with him? The answer requires some amateur psychobabble. In sports, fans and trainers sometimes see what they want to see. Beristain "wanted” to see his fighter winning. It makes sense. His emotion overtook his intellect. It happens in little league all the time. Beristain is like Marquez's father. Marquez trusts his trainer’s opinion and does what he says. Dr. Phil has left the building. In Pacquaio’s corner, Freddie Roach sensed what was happening. He told his charge to “pick it up” before the ninth round began. Interestingly, two of the three judges gave Pacquiao round nine. Marquez seemed to slow down a bit during the last three rounds. Was it because he was listening to his corner? For the record, Pacquiao landed 176 of 578 punches thrown while, Marquez landed 138 of 436. 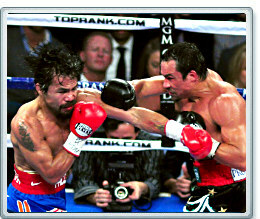 Pacquiao also edged Marquez in power shots landing 117 to Marquez' 100. Marquez did appear to land the heavier punches even though the power statistic from above disputes that. It was Pacquiao who was forcing the action. Winning a championship by counterpunching (on points) rarely happens. The old adage is the challenger has to beat the champion. Marquez had executed his fight plan flawlessly. He waited for the impatient Pacquiao (after three rounds) to strike, and then nailed him with sneaky rights, and left hooks. The 38-year-old future Hall of Famer might not win a round from Floyd Mayweather, but he has Pacquiao figured out. Pacquiao's frustration was obvious. Why couldn't he knock this guy out? His team was telling the media that the knockout would happen before round seven. Maybe they forgot to tell Marquez. Pacquiao's game plan was unraveling. Look for a fourth go around between these two champions. Maybe next time Marquez won't listen to his corner.